Originally established in 1974 as the Douglas Museum and Library, the Museum first opened in 1979 at 2800 Airport Avenue. The Museum was founded by Donald Douglas Jr, the second President of the Douglas Aircraft Company. The collection consisted primarily of artifacts and the ephemera of Donald Wills Douglas Sr., the Founder and President of the Douglas Aircraft Company, however the collection did not include any aircraft until 1989. Now the museum collection consists of the many original artifacts related to the Douglas Aircraft Company, a variety of exhibits, aviation art, and features an array of aircraft from a Wright Flyer replica to aircraft of the jet age. 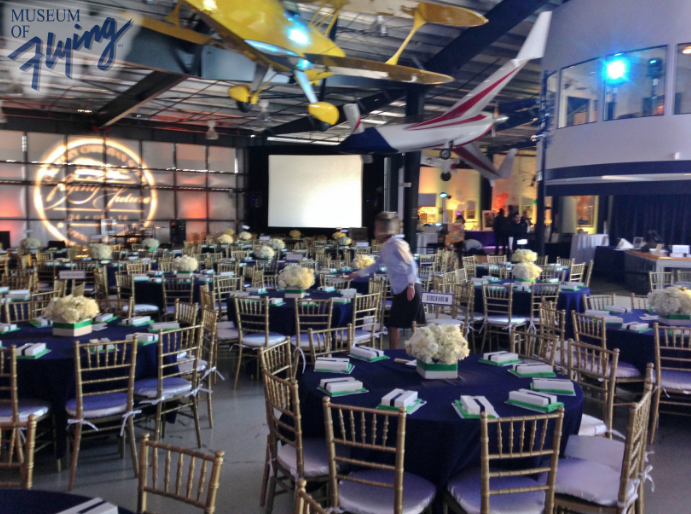 With accommodations for up to 600 total attendees for conferences, meetings, seminars, receptions, sales meetings, ceremonies, product announcements, luncheons and happy hours, the Museum of Flying is an ideal location to allow your functions to ‘take flight’ in an interesting and unusual venue that is unlike any other in the greater Los Angeles area. Your guests will be energized and inspired to engage and get the most of your function.